I’m sure there’s plenty of people who may find this recipe vaguely familiar–and you’d be right! It’s an old crockpot standby called Italian chicken. It also happens to be one dish I absolutely hate made in the crock pot. Reason is, the chicken comes out way too dry. So what I decided to do was convert this recipe to a conventional one and the best part is, you can serve it right from the skillet and omit the casserole part. 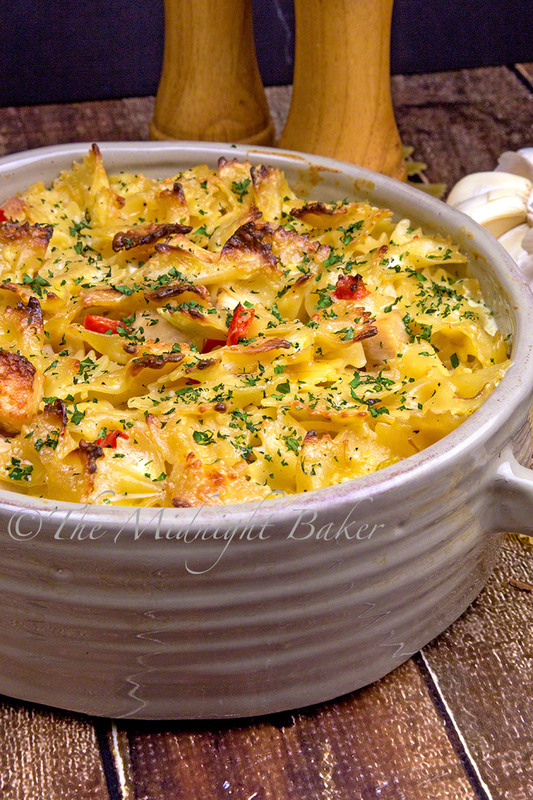 I prefer the casserole version mainly because I like how the pasta on top gets a little bit of crunch from being baked. Plus I was dying to use this new casserole dish it was made in! 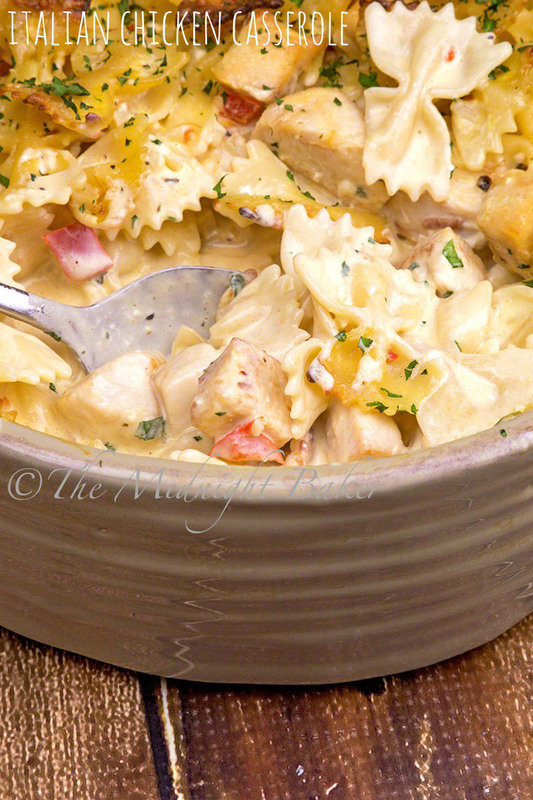 When I think of it, my version of Italian chicken is much easier than it’s slow cooker cousin. Even in the slow cooker, it’s not a “dump-and-go” recipe. You have to cook the chicken before adding the cream sauce–where you have to saute the onions and garlic before dumping in the sauce. With my stovetop/casserole version, you just have to cook the pasta. Everything else cooks in one pan. 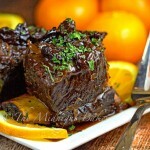 The slow cooker recipe also has more butter and cream cheese. I’ve reduced that here with no loss in flavor. In fact, I think this sauce has more flavor. 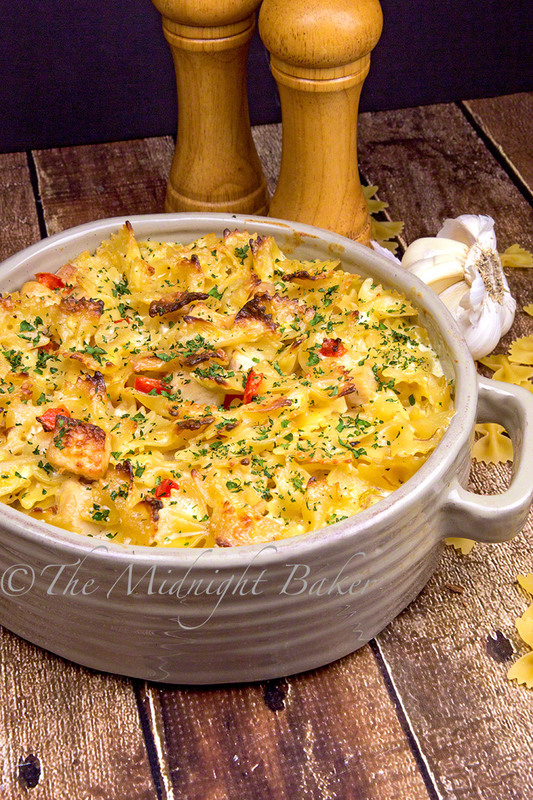 I also added some red bell pepper not only for a pop of color, but for the great flavor it gives this chicken casserole. 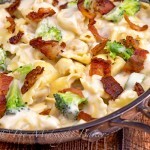 This is also a great way to use up leftover chicken and turkey and makes this a really quick meal even faster to make. Cook pasta per package directions, except cook for about 2-3 minutes LESS than recommended if making the casserole version. If you don't plan to bake in the oven, then cook pasta the recommended amount of time suggested on the package. Drain and set aside. Melt butter in a large skillet over medium heat. Brown chicken cubes. Add the onion, garlic and bell pepper and saute until onion is translucent; about 3 minutes. Add the cubed cream cheese and stir until it's melted and well blended into sauce. Then add 2 tbs of the Parmesan cheese and the dressing mix. Stir until well blended. Add the cooked pasta and toss to coat well with the sauce and heat through. May be served at this point with no additional cooking. Preheat oven to 350 degrees F. Lightly spray a 2-quart casserole (round, square or oblong--11 x 7-and 9 x 9-inch are good). 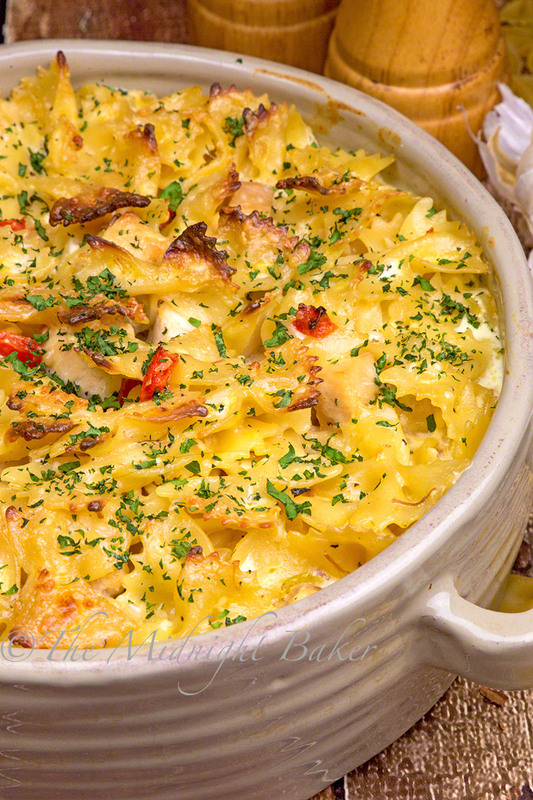 Turn chicken/pasta mixture into prepared pan. Sprinkle with the remaining 1 tbs of Parmesan cheese. 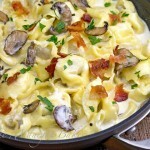 Bake for 30-40 minutes or until sauce is bubbling and pasta is getting golden brown on the top. Leftover cooked chicken may be substituted. The browning step is eliminated if using cooked chicken. Thank you Judith for the nice recipes. Have a Good Sunday. Sounds delicious!! Wish I would have had this when my kiddos were all at home 🙂 I may just have to make it for a family gathering. Have a nice evening! Enjoy the rest of your Sunday Marisa. This was really tasty! And easy! May I ease have this recipe? It sounds wonderful. I want to bake it for my neighbors who run an Italian Rest. Frances–just follow this link and scroll down and you’ll find the recipe. Under the little pic is a button to print it. This is a wonderful meal! I gave some to my neighbors and they devoured it. 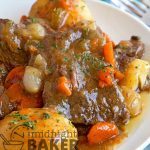 I’d like to make this (sounds delish), but I’m wondering….since you can already serve this dish after completing Step #7, will it get too dry if you bake it as a casserole? I didn’t find it too dry Angela–but you can always mix in a little more cream or milk before popping it in the oven–or even double up on the “sauce” ingredients if your family likes lots of sauce. Made this for supper tonight. It was good but was lacking something. I added (by taste) dine of Lawry’s Pepper W/ Seasoning Salt and it was really good. Thank you for the recipe. I always like trying new things. It’s a keeper. Love that you added for your taste! I do tend to undersalt/underseason stuff–old habits die hard–due to my late husband having to go low-sodium.